Granulomatosis with polyangiitis (Wegener's granulomatosis) is a type of vasculitis which can be categorized as a sub-branch of anti-neutrophil cytoplasmic antibody (ANCA)-associated vasculitides. This study examined the demographic, clinical, radiographic and laboratory characteristics of patients with granulomatosis with polyangiitis (GPA) in Imam Reza Hospital, Mahshad, Iran. The medical records of patients admitted to the Department and Clinic of Rheumatology who were diagnosed with granulomatosis with polyangiitis between January 1, 2006 and December 31, 2016 were retrospectively studied. Patients were classified according to the American College of Rheumatology (ACR) 1990 classification criteria for Wegener's granulomatosis. A total of 59 GPA-diagnosed patients (55.9% male, 44.1% female) were identified. The male-to-female ratio of the patients was 1.32:1. The mean age was 35.58±15.09 years, with the youngest and oldest patients being 10 and 71 years old, respectively. The mean disease duration was 47.5±32.88 months. The most common involved organs were the upper respiratory tract in 77.9%, lower respiratory tract in 62.7%, kidney in 59.3%, joint/muscle in 49.15%, and eye in 28.8% of patients. Four (6.7%) patients died during the follow-up which had a mean of 3.9 years. In the studied region, GPA inflicts the younger population, and it is more common in males. Instances of upper respiratory tract, lower respiratory tract, and kidney involvement are less common in the present study than in most other studies. GPA might have less severe manifestations in the studied area than in other regions. Granulomatosis with polyangiitis (GPA), previously known as Wegener's granulomatosis, is a type of vasculitis which can be categorized as a sub-branch of anti-neutrophil cytoplasmic antibody (ANCA)-associated vasculitides . Originally, the disease was named for Friedrich Wegener who discussed the disorder in 1936 . In January 2011, Wegener granulomatosis was renamed granulomatosis with polyangiitis (GPA) because of Dr. Wegener’s connection with the Nazi regime [3, 4]. The initial event in GPA is ANCA-induced leukocyte activation, in which polymorphonuclear-derived mediators (i.e. lipid metabolites, cytokines, etc.) are intimately involved. The result is necrotizing inflammation of blood vessel walls . The GPA incidence rate is 6.5-11 cases per million per year. Granulomatosis with polyangiitis is the third most common type of vasculitis in Iran after Behcet’s disease and cutaneous leukocytoclastic angiitis . This disease has a tropism for the respiratory tract and kidneys. Respiratory manifestations are erosive rhinosinusitis, septal perforation, saddle nose deformity, subglottic stenosis, pulmonary nodules, and diffuse alveolar hemorrhage . The current study purposed to examine the demographic, clinical, radiographic, and laboratory characteristics of the GPA in Mahshad, Iran and compare them with those of other studies. The medical records of patients admitted to the Department and Clinic of Rheumatology of Imam Reza Hospital, Mashhad, Iran who were diagnosed with granulomatosis with polyangiitis between January 1, 2006 and December 31, 2016 were retrospectively studied. Patients were classified according to the American College of Rheumatology (ACR) 1990 classification criteria for Wegener's granulomatosis  and 2012 Revised International Chapel Hill Consensus Conference Nomenclature . All inpatients and outpatients who met the ACR 1990 criteria for the classification of Wegener's granulomatosis were included in the study. The following data was collected from the patients' files: age at onset of disease, gender, disease duration, clinical and laboratory features, and types of treatment. The program SPSS (Statistical Package for the Social Sciences) 20 was used for data entry and analysis. Categorical variables are shown as percentages and continuous data as means and standard deviations (mean ± SD). A total of 59 GPA-diagnosed patients (55.9% male, 44.1% female) were identified. The male-to-female ratio was 1.32:1. The mean age was 35.58±15.09 years with the youngest and oldest patients being 10 and 71 years old, respectively. The mean disease duration was 47.5±32.88 months. The clinical features, laboratory data, and radiographic findings of the studied patients are summarized in Table 1. Rare manifestations included autoimmune hemolytic anemia, thrombotic thrombocytopenic purpura, digital gangrene, and deep vein thrombosis (each in 1 patient). One patient developed esophageal cancer 15 months after GPA presentation. Erythrocyte sedimentation rate (ESR) was elevated in 55 (93.2%) patients (minimum 6, maximum 126, mean 80.25±36.10 mm/1st hour). One patient had chronic hepatitis B. All patients had received corticosteroids. Other medications included cyclophosphamide in 82.1%, rituximab in 13.2%, azathioprin in 47.2%, methotrexate in 27.8%, trimethoprim-sulfamethoxazole in 46.3%, and mycophenolate mofetil in 3.8% of patients. Plasma exchange was performed in 5.1% of patients. Four (6.7%) patients died during the follow-up with a mean of 3.9 years (the etiologies included pulmonary complications in two patients, sepsis in one, and multi-organ failure in another). Despite the broad range of presentations and subsequent courses in GPA, longitudinal analyses of larger cohorts agree, for the most part, on the frequency of involvement of different organ systems over time [9, 10]. The typical constitutional symptoms seen in patients include fever, malaise, and anorexia. The frequency of such symptoms in the current study was 77.9%, which is similar to that of other studies . differences have been observed . In the present study, the frequency of GPA was higher in males, and the male-to-female ratio was 1.32:1. GPA is more likely to affect adults; a small number of young adults and children may be affected. The mean age of patients at diagnosis is between 40 and 55 years . The mean age of patients in this study was lower in comparison with most other studies (35.58±15.09 years). This difference may be due to the younger population of Iran. Although GPA is often limited to a small number of organs, it affects a broad range of systems. . A typical presentation includes involvement of the upper respiratory tract, lungs, and kidneys . Upper respiratory tract (URT) disease occurs in 95% of patients with GPA . URT was involved in 77.9% of patients in the present study, which was less than its rate as observed in other studies. Common sites for GPA involvement are the pulmonary parenchyma and bronchi, and, rarely, the pleura . In the present study, 62.7% had pulmonary parenchyma involvement; this rate is lower than that in other studies (66%-85%) . No patient experienced pleurisies in the current study. Renal involvement is common in GPA (77%-85%) . The frequency of renal involvement in the current study was 59.3%, which is less frequent than in most other studies . Ocular and orbital involvement arise in 20% to 50% of patients with GPA . In the current study, 28.8% of patients had eye involvement. Ill-defined myalgia and/or arthralgia may occur in 50-67% of patients . The frequency of musculoskeletal pain in the current study was 49.15%. Central nervous system (CNS) involvement has been reported in 8-11% of patients . The CNS was involved in 15.2% of patients in the current study. Peripheral neuropathy has been reported in 15-40% of patients , whereas it was seen in 5% of patients in this study, less frequently than in most studies. Approximately 90% of patients with active, generalized GPA are cANCA positive . In the present study cANCA was positive in 91.5% of patients, which simulates the frequency in other studies. Immunosuppressive therapy is warranted in almost all patients with active GPA. Initial immunosuppressive therapy in granulomatosis with polyangiitis (GPA) consists of glucocorticoids combined with either cyclophosphamide or rituximab . All patients in the current study had received corticosteroids. Cyclophosphamide and rituximab were prescribed for induction of remission in 82.1% and 13.2% of patients, respectively. The remaining patients had a milder form of the disease and had received methotrexate, azathioprine, or mycophenolate mofetil as their initial therapy. The efficacy of plasma exchange in patients with GPA is uncertain. Plasma exchange was prescribed in 5.1% of the present patients. GPA is associated with considerable morbidity and mortality. In different series, the mortality rates have ranged from 12-28% at 7 to 8 years to 24-44% in 4 to 10 years . In the current study, four (6.7%) patients expired during follow-up which had a mean of 3.9 years. The main causes of death in patients with GPA stem from complications from immunosuppressive therapy (e.g., infections), the underlying disease (e.g., renal failure, pulmonary failure), or cardiovascular disease . The causes of death in the present study included pulmonary complications in 2 patients, sepsis in 1 patient, and multi-organ failure in 1 patient. This study has some limitations. First, it is a small, retrospective study. A larger cohort study is needed to evaluate not only the clinical and laboratory features of GPA, but also the response to treatment, clinical course, and its prognosis. The patients in the current study were compared with those of other studies, some of which were large cohort studies. As the current research is not a real cohort study, this comparison should be done with caution. In the region of Mahshhad, Iran, GPA presents at a younger age, and it is more common in males. Upper respiratory tract, lower respiratory tract, and kidney involvement are less common in the present study than in most other studies. In the study region, GPA may be less severe than in other regions. Jennette JC, Falk RJ, Bacon PA, Basu N, Cid MC, Ferrario F, et al. International Chapel Hill Consensus Conference. Nomenclature of Vasculitides. Arthritis Rheum2013; 65: 1-11. doi: 10.1002/art.37715. Wegener F. Über generalisierte, septische Gefaserkrankungen.Verh Dtsch Ges Pathol1936; (29): 202-10. Falk RJ, Gross WL, Guillevin L, Hoffman GS, Jayne DR, Jennette JC. Granulomatosis with polyangiitis (Wegener's): an alternative name for Wegener's granulomatosis. Arthritis Rheum 2011; 63(4): 863. doi: 10.1002/art.30286. Gross WL, Trabandt A, Csernok E. Pathogenesis of Wegener's granulomatosis. Ann Med Interne (Paris) 1998; 149(5): 280-6. Ntatsaki E, Watts RA, Scott DG. Epidemiology of ANCA-associated vasculitis. Rheum Dis Clin North Am 2010; 36(3): 447-61. doi:10.1016/j.rdc.2010.04.002. Jokar M, Mirfeizi Z. Epidemiology of Vasculitides in Khorasan Province, Iran. Iranian Journal of Medical Sciences. 2015; 40(4): 362-366. Seo P, Stone JH. The antineutrophil cytoplasmic antibody-associated vasculitides. Am J Med 2004; 117(1): 39-50. doi: 10.1016/j.amjmed.2004.02.030. Leavitt RY, Fauci AS, Bloch DA, Michel BA, Hunder GG, Arend WP. The American College of Rheumatology 1990 criteria for the classification of Wegener's granulomatosis. Arthritis Rheum 1990; 33(8): 1101-07. Hoffman GS, Kerr GS, Leavitt RY, Hallahan CW, Lebovics RS, Travis WD. Wegener granulomatosis: an analysis of 158 patients. Ann Intern Med 1992; 116: 488-498. doi: 10.7326/0003-4819-116-6-488. Reinhold-Keller E, Beuge N, Latza U, de Groot K, Rudert H, Nölle B. An interdisciplinary approach to the care of patients with Wegener’s granulomatosis: long-term outcome in 155 patients. 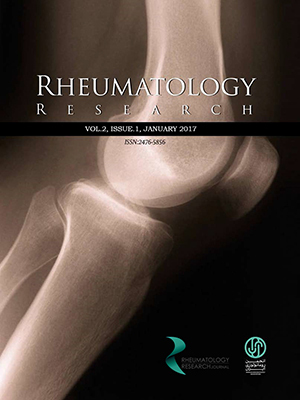 Arthritis Rheum 2000; 43(5): 1021-1032,. doi: 10.1002/ 1529-0131(200005)43:5<1021:: AID-ANR10>3.0.CO;2-J. Koldingsnes W, Nossent H. Predictors of survival and organ damage in Wegener's granulomatosis. Rheumatology 2002; 41(5): 572-81. Fauci A.S, Haynes B.F, Katz P, Wolff S.M. Wegener’s granulomatosis: prospective clinical and therapeutic experience with 85 patients for 21 years. Ann Intern Med 1983; 98(1): 76-85. doi: 10.7326/0003-4819-98-1-76. Yi ES, Colby TV. Wegener’s granulomatosis. Semin Diagn Pathol 2001; 18(1): 34-46. Langford CA, Hoffman GS. Rare diseases. 3: Wegener’s granulomatosis. Thorax 1999; 54(7): 629-37. doi:10.1136/thx. 54.7.629. Griffith ME, Gaskin G, Pusey CD. Classification, pathogenesis, and treatment of systemic vasculitis. Ren Fail 1996; 18(5): 785-802. doi: 10.3109/ 08860229609047707. Almouhawis HA, Leao JC, Fedele S, Porter SR. Wegener’s granulomatosis: a review of clinical features and an update in diagnosis and treatment. J Oral Pathol Med 2013; 42(7): 507-516. doi: 10.1111/jop.12030. Khan AM, Elahi F, Hashmi SR, Mahida KH, Ingrams DR. Wegener’s granulomatosis: a rare, chronic and multisystem disease. Surgeon 2006; 4(1): 45-52. doi: 10.1016/S1479-666X(06)80021-1. Berge S, Niederhagen B, von Lindern JJ, Appel T, Reich RH. Salivary gland involvement as an initial presentation of Wegener’s disease. A case report. Int J Oral Maxillofac Surg 2000; 29(6): 450-2. doi:10.1034/j.1399-0020. 2000. 290613.x. Lamprecht P, Gross WL. Wegener’s granulomatosis. Herz 2004; 29(1): 47-56. doi: 10.1007/ s00059-004-2525-0. Reinhold-Keller E, Beuge N, Latza U, de Groot K, Rudert H, Nölle B. An interdisciplinary approach to the care of patients with Wegener’s granulomatosis: long-term outcome in 155 patients. Arthritis Rheum 2000; 43(5): 1021-1032. doi: 10.1002/ 1529-0131(200005)43:5<1021:: AID-ANR10>3.0.CO;2-J. Fechner FP, Faquin WC, Pilch BZ. Wegener’s granulomatosis of the orbit: a clinicopathological study of 15 patients. Laryngoscope 2002; 112(11): 1945-50. doi: 10.1097/00005537-200211000-00007. Frosch M, Foell D. Wegener granulomatosis in childhood and adolescence. Eur J Pediatr 2004; 163(8): 425-34. doi: 10.1007/ s00431-004-1464-3. Chung S, Monach P.A. Anti-neutrophil Cytoplasmic Antibody–Associated Vasculitis. In: Kelley & Firestein’s Textbook of Rheumatology Edited by Gary S. 10 end. Elsevier, Philadephia; 2017; 1541-1558. doi: 10.1016/ b978-0-323-31696-5.00089-9. Hoffman GS, Specks U. Antineutrophil cytoplasmic antibodies. Arthritis Rheum 1998; 41(9): 1521-37. doi: 10.1002/ 1529-0131(199809)41: 9<1521:: AID-ART2>3.0.CO;2-A. Yates M, Watts RA, Bajema IM, Cid MC, Crestani B, Hauser T. EULAR/ERA-EDTA recommendations for the management of ANCA-associated vasculitis. Ann Rheum Dis 2016; 75(9): 1583-94. doi: 10.1136/ annrheumdis-2016-209133. Robson J, Doll H, Suppiah R, Flossmann O, Harper L, Höglund P. Damage in the ANCA-associated vasculitides: long-term data from the European vasculitis study group (EUVAS) therapeutic trials. Ann Rheum Dis 2015; 74(1): 177-84. doi: 10.1136/ annrheumdis-2013-203927. 27. Lai QY, Ma TT, Li ZY, Chang DY, Zhao MH, Chen M. Predictors for mortality in patients with antineutrophil cytoplasmic autoantibody-associated vasculitis: a study of 398 Chinese patients. J Rheumatol 2014; 41(9): 1849-55. doi: 10.3899/jrheum.131426.